The Whitehouse: The most powerful moment you’ll watch today! 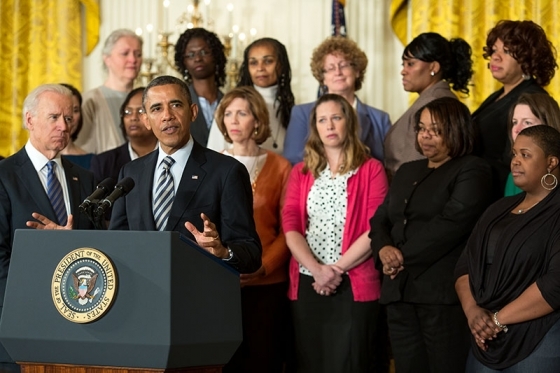 He was in the East Room, standing with a group of mothers who have lost children to gun violence. He was pushing Congress to act on common-sense steps to help protect our kids by reducing that kind of violence. Measures like eliminating background check loopholes that an overwhelming majority of Americans support. Today, President Obama promised the American people that he had not forgotten the 20 innocent children and six brave educators who lost their lives at Sandy Hook Elementary more than 100 days ago. Standing with parents and teachers of gun violence victims, he urged Congress to Take Action that will protect other children and families from the pain and grief these families have experienced. Nothing is more powerful than millions of voices calling for change. And that’s why it’s so important that all these moms and dads are here today. But that’s also why it’s important that we’ve got grassroots groups out there that got started and are out there mobilizing and organizing and keeping up the fight. That’s what it’s going to take to make this country safer. It’s going to take moms and dads, and hunters and sportsmen, and clergy and local officials like the mayors who are here today standing up and saying, this time really is different — that we’re not just going to sit back and wait until the next Newtown or the next Blacksburg or the next innocent, beautiful child who is gunned down in a playground in Chicago or Philadelphia or Los Angeles before we summon the will to act. We are 90% of the way there, and bravo to all those that have the willingness to Take Action. … as it will take the ‘whole village‘ to ‘raise this child‘ !! !